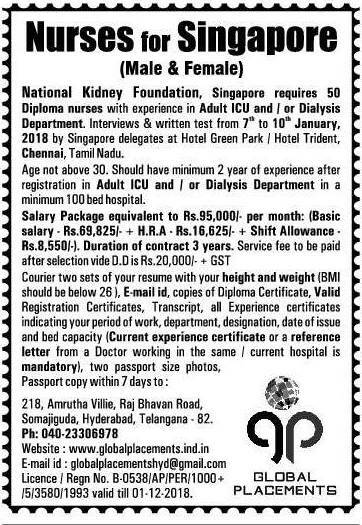 NATIONAL KIDNEY FOUNDATION SINGAPORE Requires 50 Diploma nurses with experience in Adult ICU and or Dialysis Department. interested and eligible candidates can apply . More details given below. Interviews and written test from 7th to 10th January 2018 by Singapore delegates at Hotel Green park / Hotel Trident Chennai , Tamil Nadu.